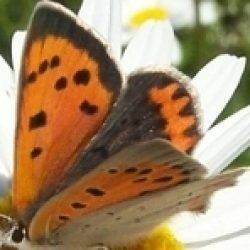 The Brown Hairstreak is one of our most elusive yet most conspicuous butterflies. The adult is rarely seen but the egg is easily found. This paradox may be part of the butterfly’s appeal. 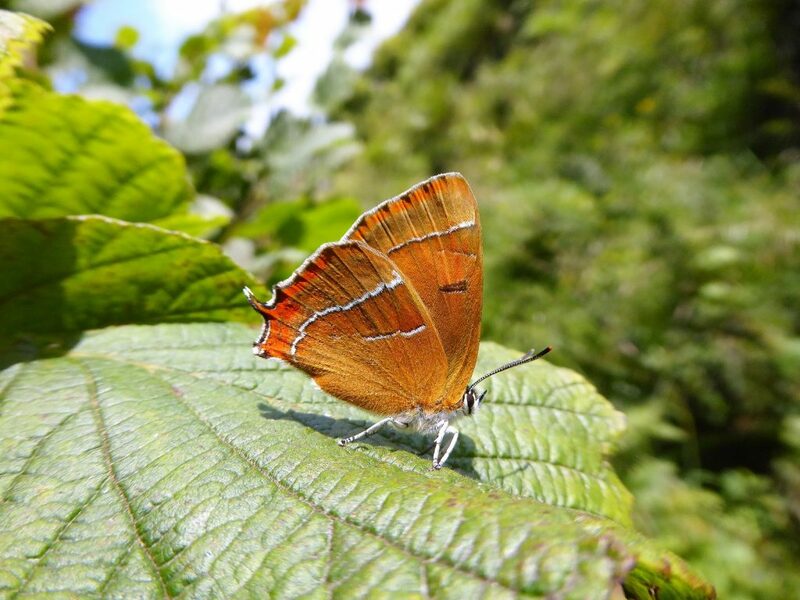 Among butterfly lovers in the UK the Brown Hairstreak has a cult status, evidenced by having its own blog (http://betulae.blogspot.ie/). It is an attractive butterfly, the female especially delightful with a warm golden underside with a patch of the same striking hue on the upper-side of the fore-wings. Aside from the golden patch the upper-sides are dark brown. 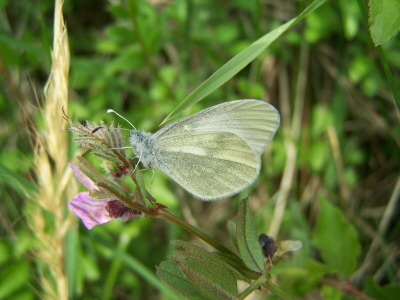 Males look similar, but the underside gold is paler and the fore-wing patch paler and reduced or absent. The reddish-gold tails on the hind-wings add to its charms. The legs are a striking white, resembling starched white sport socks. 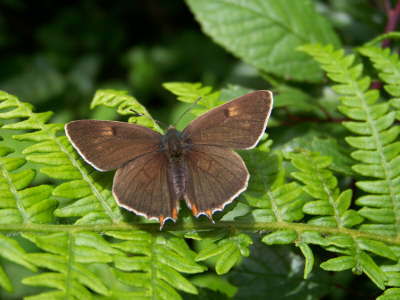 The Brown Hairstreak is the largest hairstreak in Ireland and is not common here or in Britain (we have three hairstreaks; the Green Hairstreak and Purple Hairstreak are the others). In Ireland it is mainly found in the Burren in Clare and Galway, with a small population in west Tipperary and west of Lough Corrib, County Galway. In Britain it is mainly found further south, in south-west Wales, southern, south-west and south central England with a small population in the east, in Lincolnshire. 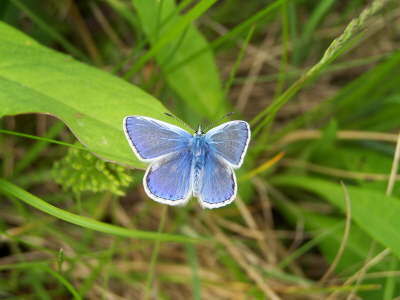 The butterfly is single-brooded, flying from late July to mid-September. It breeds on hedges, scrub and woodland edges. It needs an extensive area of untidy, lightly or rarely managed habitat containing its larval host-plant, Common Blackthorn. Where it inhabits climax woodland the adult is rarely seen because it keeps to the tree-tops. In this habitat, such as in Garryland Wood, Galway, it frequents Common Ash trees where it feeds on the aphid ‘honeydew’, secreted by aphids feeding on the leaves. This sticky substance coats the leaves when aphids are in abundance, so the adults do not need to descend to feed on nectar. In years when the aphid secretions are ample, woodland males are rarely observed. Adults mate early in the day. The rest of the day is mainly spent feeding and basking. It appears to be a very lazy butterfly; it flies infrequently, preferring to walk from one food source to the next. Strong wind does not appear to dislodge them. Males occasionally chase each other, but often they ignore each other and mated females. 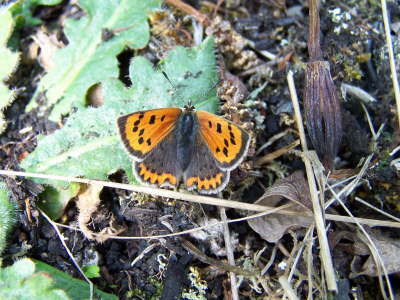 Later in the flight period, typically from mid-August, females disperse to lay eggs on low-growing Common Blackthorn. This is when most sighting opportunities occur. Even then, females do not advertise their presence. Egg-laying females crawl into the interior of a plant probing the surface of young stems for a suitable point, often at the base of a fork, bud or spine, to place her white egg. Occasionally she will deposit two or even three, but usually a single egg is laid before she flies away to seek another food-plant. 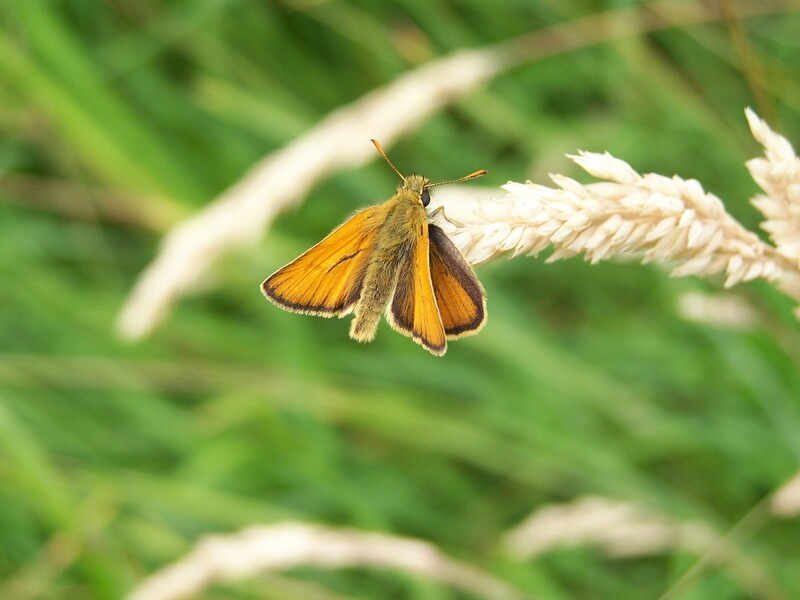 When moving to seek new larval food-plants, she will sometimes cross open ground, and fly well above head height, making the butterfly hard to spot. Plants favoured for egg-laying are often young, and are in sheltered and unshaded locations. The egg has a pitted surface, resembling a golf ball. Although a sharp white, it is not easy to find until leaf fall. Then it comes into its own! It stands out against the dark twigs, even in low light. The eggs are usually placed below 1.5 metres above ground (although sometimes higher; I observed egg-laying three metres above ground in Tipperary). The eggs are laid from mid-August to mid-September and remain unhatched until leaf burst in April. 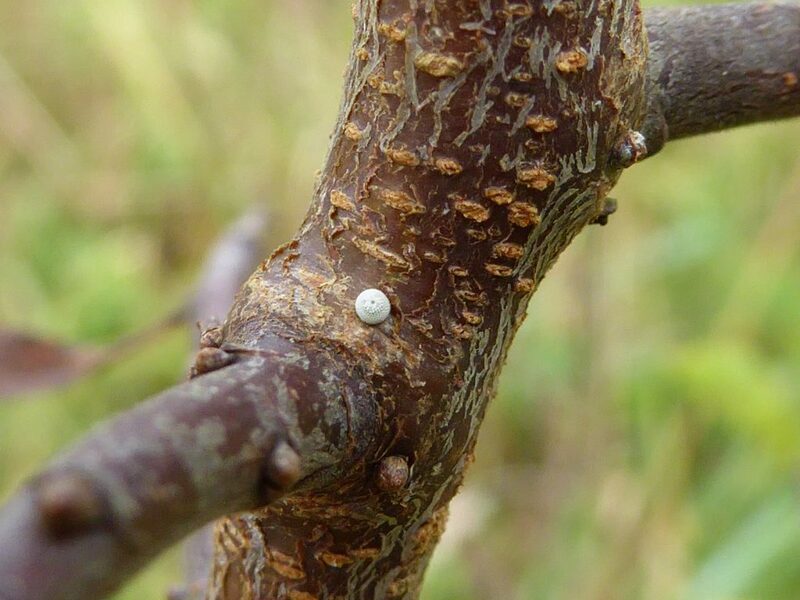 However, eggs remain on the plant after hatching because the larva only bites a whole in the tough shell to emerge from. I have seen eggs remain on a plant for two years, a testament to their durability. 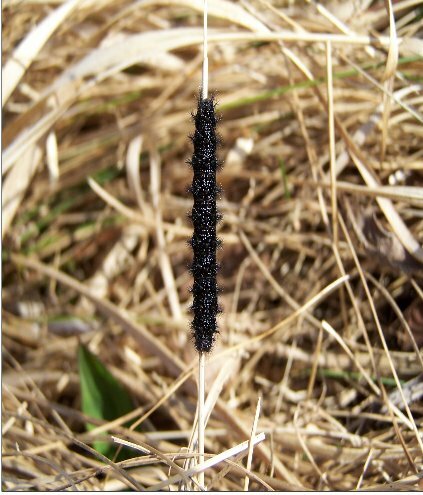 The larvae are mainly green with diagonal white lines. The larva is slug-like in its shape and, like the rather languid adult, sluggish in its movements. In keeping with the adult’s elusiveness, the larva is mainly nocturnal and very hard to find. The pupa too is concealed. 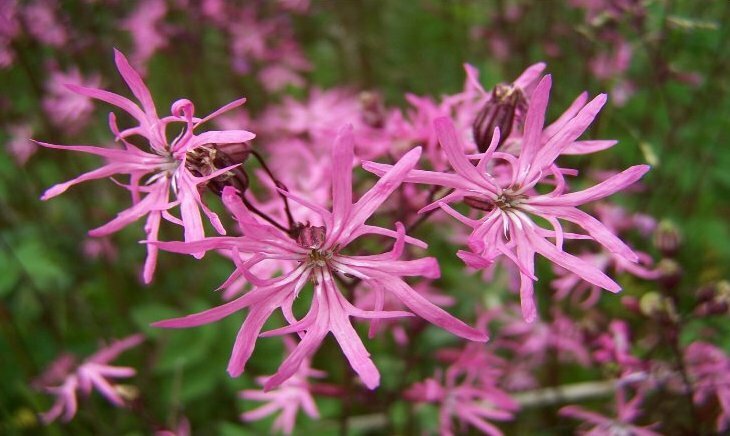 It is formed in June or early July, probably in a crack in the soil or beneath leaf litter or within grass tussocks. It is likely that the pupa has an association with ants. 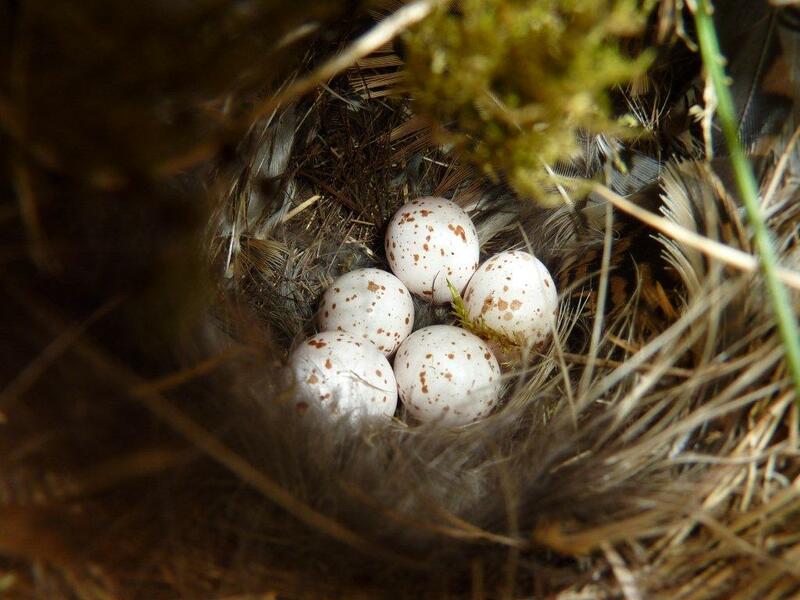 Where the general landscape’s hedges and scrub are lightly managed over time, annual egg surveys pose interesting questions about the breeding requirements of the species. 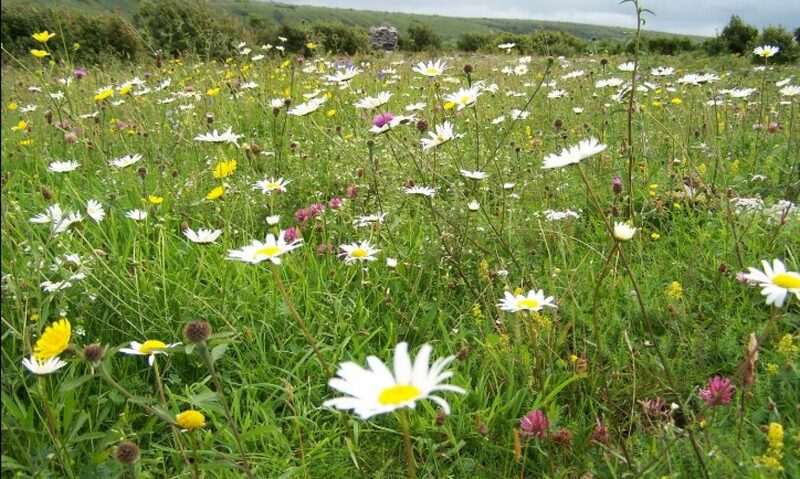 For example, breeding sites can receive fewer eggs over time before these eventually fall out of use. 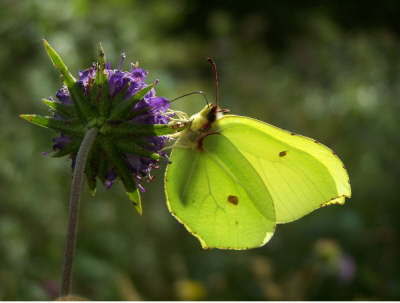 Identifying the reasons for this will add to knowledge of the butterfly’s requirements. Reasons for selection of breeding sites are not easy to determine. In the Burren where tall trees are scarce or absent, the adult feeds low down on hedges containing flowering bramble. 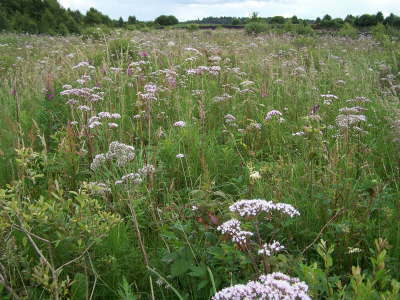 While the butterfly breeds on these hedges some adult feeding areas are not used for breeding, even though the larval food-plants and aspect appear suitable. Last weekend I snatched a couple of hours from an onerous schedule to do a quick egg-hunt at Gortlecka, in the Burren National Park in Clare. On a wonderful mild afternoon I searched a south facing hedge and adjoining patch of scrub where I saw a female lay an egg in August. Within a 20 metre long section of young blackthorn scrub/hedge I found 16 eggs, a couple just 30 cm above the ground. Fifteen eggs were laid at or close to the base of a lateral shoot with one laid slightly further up the side shoot, above three buds. This patch of scrub has developed in the past five years and this is the first time I have found eggs here, although I found eggs on the adjoining hedge in previous years. Despite annual searches over more than a decade I have not found eggs on a west facing hedge very close by, despite seeing females here last August, and in most years from the early 2000’s; however, I have found eggs on west facing scrub elsewhere at Gortlecka. Why it behaves like this is unclear but it is reassuring that the butterfly continues to thrive where I first saw it in the late 1990’s. 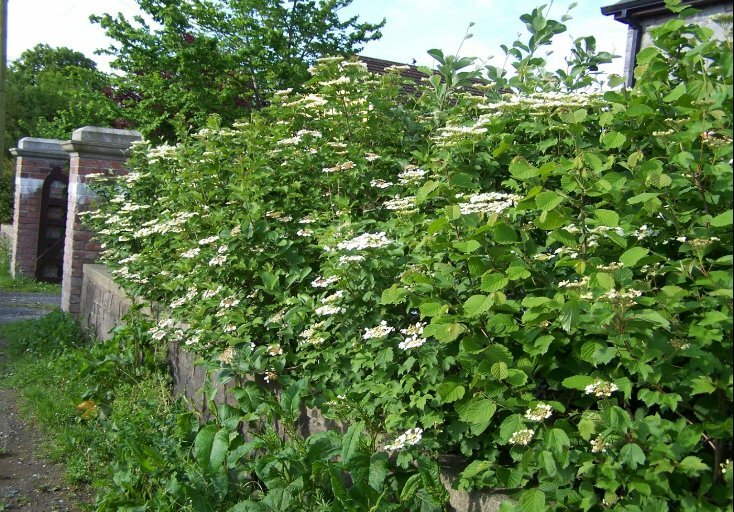 Regarding conservation, the species is highly vulnerable to extreme and regular cutting of hedges. While opening up rides in darkening woodland and then allowing plants to re-grow helps the species, annual flailing of hedges is very damaging, as most eggs are laid at the edge of a hedge. In areas where it occurs, rotational cutting should be applied, with large sections, around two-thirds, uncut in any year. 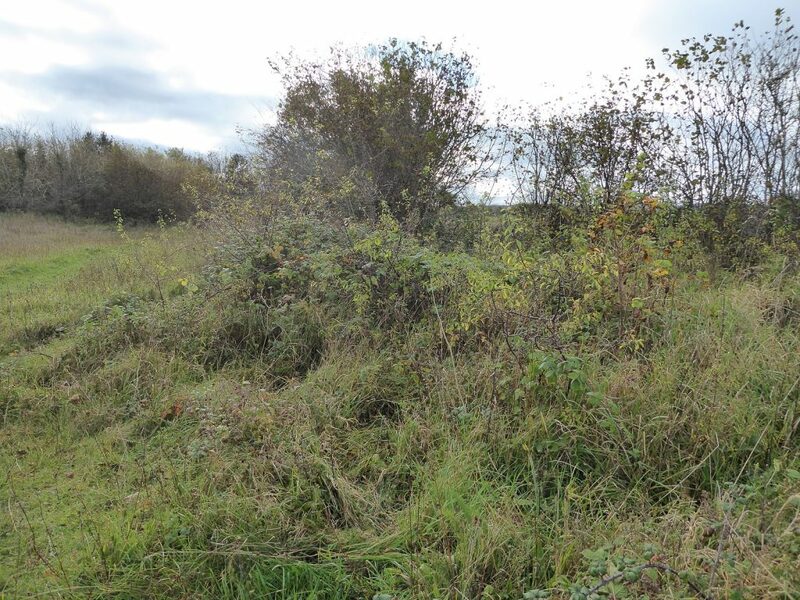 It is important to retain patches of young scrub growing a short distance from a hedge or wood edge, as young plants are often favoured by our rarest hairstreak. 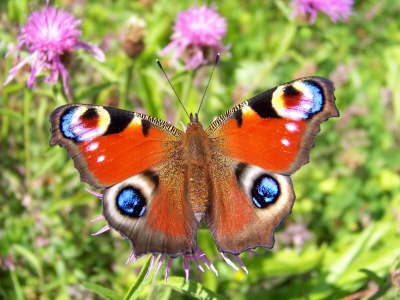 Why are many butterfly lovers so taken with this butterfly? Like many obsessions, the reasons for it may be obscure, but the elusiveness of the adult juxtaposed with the visibility of the egg might be something to do with it. So might timing. 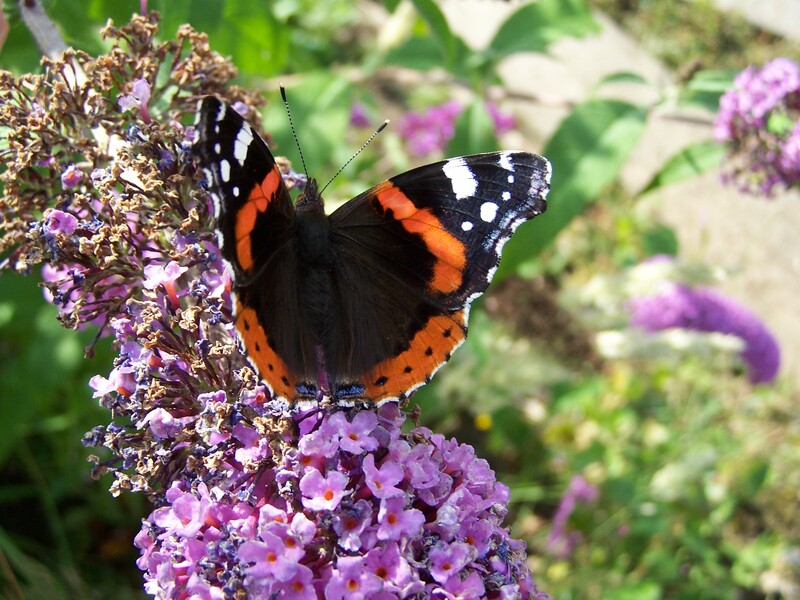 What else can a lover of butterflies do during the barren, bleak , unforgiving months from November to March? Egg hunts provide a badly needed outlet for pent-up desire, as well as offering an insight into how well the population is performing. Brown Hairstreak breeding habitat, Burren National Park, Co. Clare.©J.Harding. Brown Hairstreak egg, Burren National Park, Co. Clare.©J.Harding. Brown Hairstreak, female, Burren National Park, Co. Clare.©J.Harding.